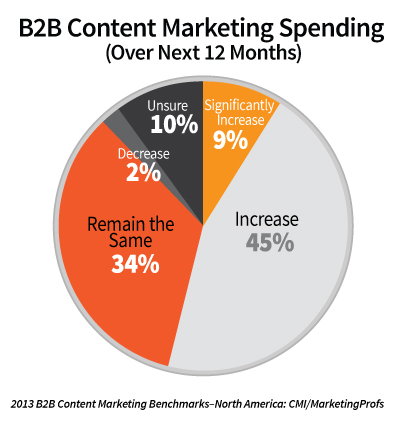 A recent study by MarketingProfs and the Content Marketing Institute shows that over half (54%) of B2B marketers plan to spend more on content marketing in 2013 than in previous years. The study is the 2013 B2B Content Marketing Benchmarks, Budgets and Trends – North America. Here I must make my usual side note comment about studies and their sources – this study that shows an increase in content marketing spending was done by the Content Marketing Institute (CMI), which used to be Junta42. CMI is a group of consultants who make money on content marketing consulting. Just sayin’! Should you join in this content marketing trend? Here are three reasons why it’s important. 1. Content marketing is working. B2B Marketers are getting results by published value-add, downloadable content online. 2. Buyers don’t want to be sold to. Buyers want access to information when they are ready to buy. If you have great content that is easily accessible, you have a greater chance of creating a positive brand impression. 3. Search engines rank websites with quality, relevant content higher. And, of course, the more engagement (shares of and comments about your content), the better! Below are links to three of my previous blog posts about marketing content that might be useful to you. 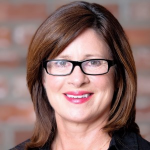 If you want help coming up with a marketing content strategy, contact me today. I’ve helped several companies increase content creation to successfully attract and engage qualified prospects. Previous post: B2B Marketers: Why You Should “F” Your Website Content!